The rearrangement is a reaction in which an atom or bond moves or migrates, having been initially located at one site in a reactant molecule and ultimately located at a different site in a product molecule. Migrations of a carbon atom with its lone pair are called alkyl shifts. A rearrangement reaction is a board class of organic reactions and it can accompany many of the reactions such as substitution, addition, and elimination reactions. 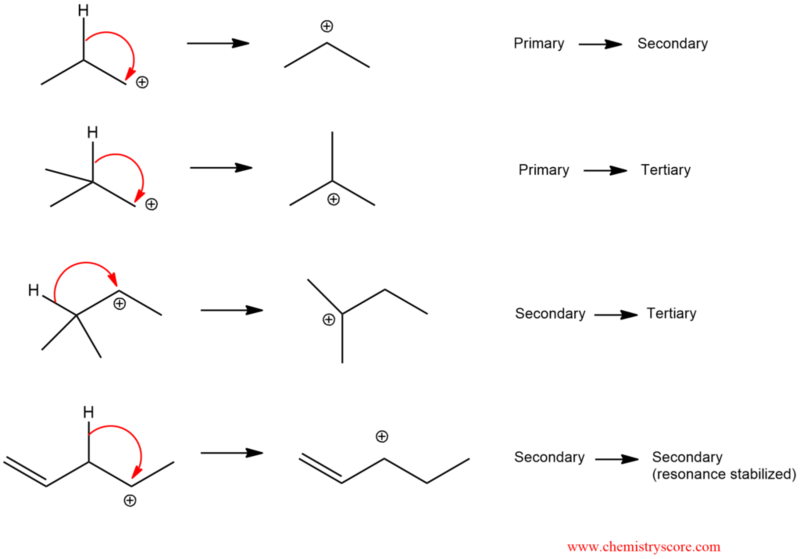 In this example above, we can occur that if we have quaternary carbon next to secondary carbocation the most common situation is a migration of alkyl group (or just alkyl shift). The carbocation is a carbon atom with six electrons bearing a positive charge. The carbocation is an electron deficient and it needs two electrons to full octet. This means that the carbocation has empty π orbital and the C-C bond can donate the pair of electrons into this orbital. In the transition state, there are partial bonds between the carbon being transferred and each of the two adjacent carbon atoms. Then, as one bond shortens and the other lengthens, we end up with a (more stable) tertiary carbocation. 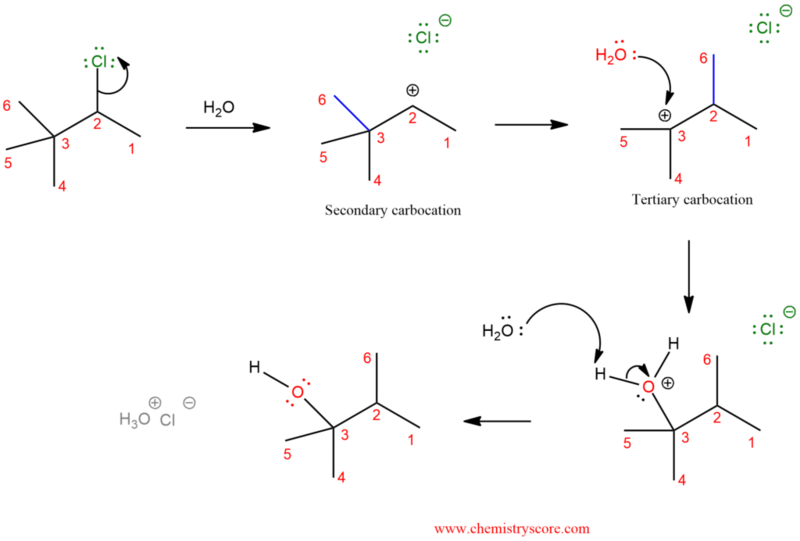 Reactions that go through carbocations can sometimes undergo rearrangements. Stability of carbocations increases as you go from primary to secondary to tertiary. The carbocation is also stabilized by resonance and in every situation where we have unstable carbocation can be transformed into a more stable carbocation. 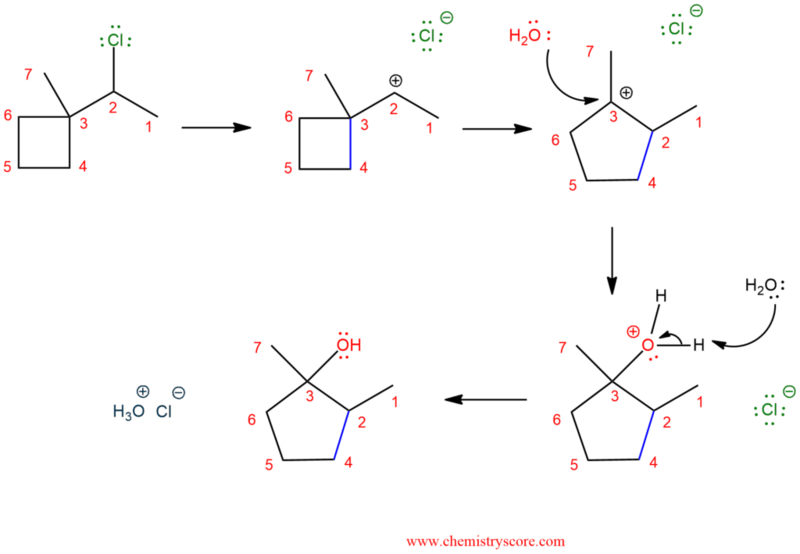 Take a look at this example of an SN1 with alkyl shift. 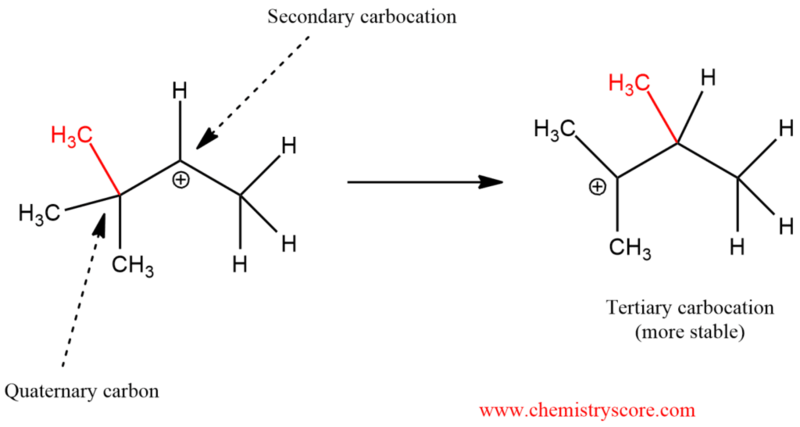 In the first step, we have loss of the leaving group and we get secondary carbocation. But, like in the first example, quaternary carbon is in adjacent to secondary carbocation and this is a good way to get more stable carbocation. The tertiary carbocation is then attacked by the nucleophile (water in this case) which deprotonated to give the neutral alcohol. In the following example, we can see that the methyl group does not always have to be a group that moves. Even though the CH3 could potentially migrate in this case, it is favorable to shift one of the alkyl groups in the ring, which leads to ring expansion and the formation of a less strained, five-membered groups in the ring.